At the depth of seventy metres – two hundred and ten feet – deeper than most of recreational divers have ever been – you reached to an enormous merchant ship wreck. You were wearing gloves protecting your hands, but you were touching everything really carefully, in order to prevent from cutting yourself with sharp metal edges. With the touch, somewhere deep down in your mind, you could feel the explosion which had sunk the ship. You could hear it as an echo from decades before, described in official reports and black and white movies. The past became the present and living history. No book, no picture and no story can convey this – only being here and now. That is why you had decided to do all the things that brought you here – years of experience, weeks of training, hours of planning, money and danger – it was all worth this moment. 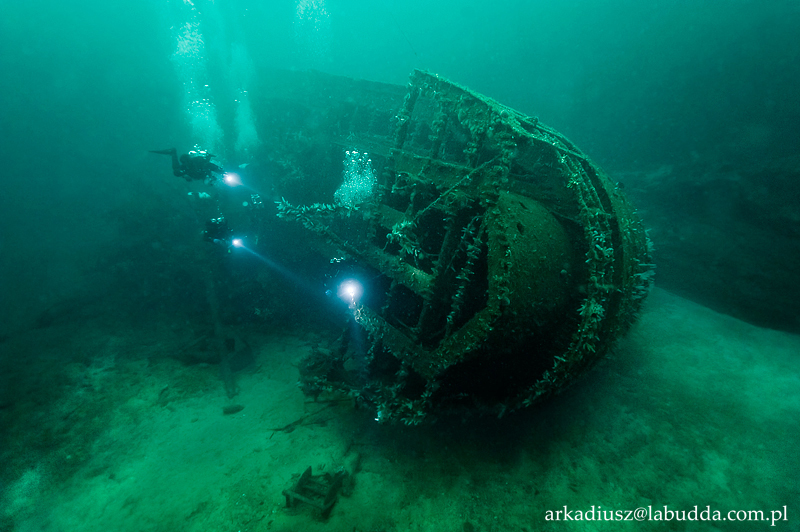 One of the most popular forms of technical diving is deep shipwreck diving. Inside of deeply sunken wrecks there is well-preserved evidence of history. Such dives will lead you to places and experiences unavailable for recreational divers, but it comes at a price. Deep technical diving is more dangerous. The only way to limit the risks is using proper equipment and training. Deep diving requires acquiring initial skills, experience, hours of practice and improving these skills and eventually using everything you have learnt, without exceptions or compromises. Even then deep technical diving is connected with far greater risks than recreational diving – you must be aware of this and accept it. Diving deeper than 55 meters we do not use air for breathing. It is too dense and too narcotic. The amount of nitrogen, that dissolves in our blood, increases with depth, which has narcotic influence on a diver and interferes with their perception. In order to dive deep safely, we use special breathing gases containing helium (trimix), that replace nitrogen from the air and reduce its narcotic influence. 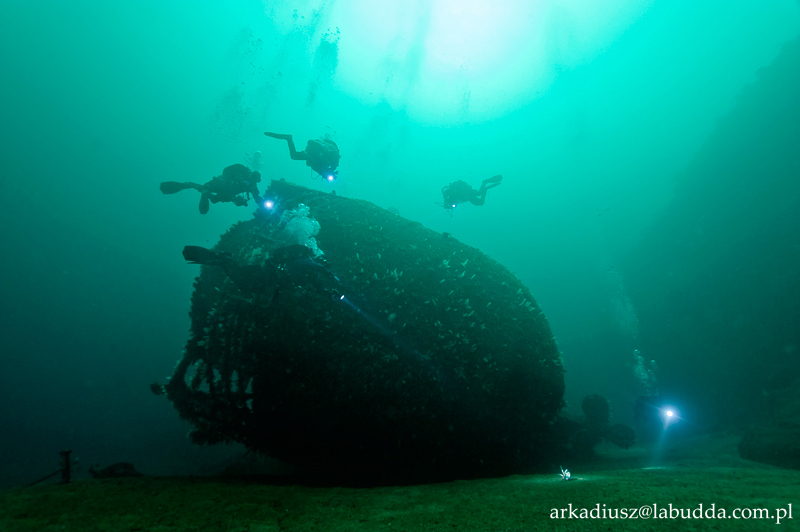 We offer you courses that will enable you to dive at such or bigger depths. 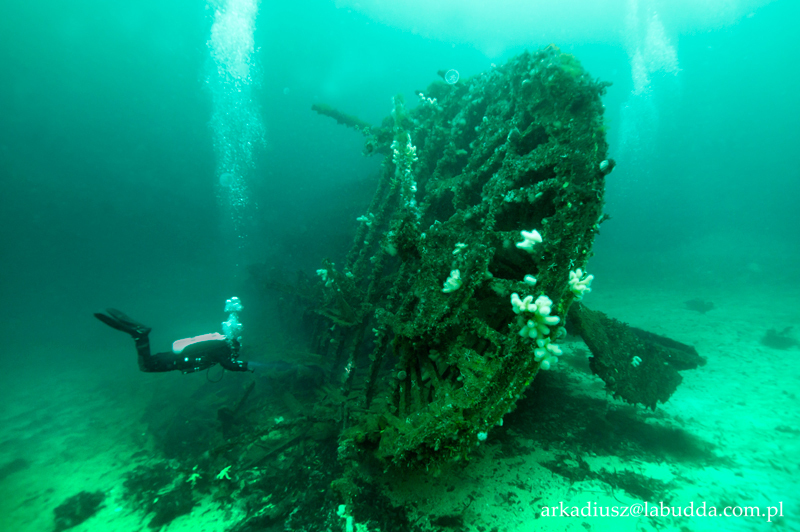 If you are ready for wreck diving, enrol to a proper course or just call me and we will decide what you need. deep diving using air (2 or 3 levels of training, according as the association. Range of depth 50-55m). deep diving using trimix (2 or 3 levels of training, according as the association. Maximum depth during the course of 100 m. After completing the training – no depth limitation). Apart from this, technical training can be supplemented with various specialities, depending on specific needs of the diver , e.g. Advanced Wreck Diver. This programme combines recreational and technical diving, with accelerated decompression permitted (up to 15 minutes). This Program is designed to extend the diver’s knowledge and skills in the use of EANx for recreational diving. It further develops diving skills and provides a greater understanding of the rules of diving using mixtures with higher oxygen content. This program qualifies divers to perform dives up to 42 meters deep with maximum accelerated decompression with EAN 50, Oxygen time of 15 minutes. Must be qualified as an IANTD EANx Diver and IANTD Deep Diver with proof of a minimum of 25 logged dives or sufficient experience to satisfy the instructor that the student has the ability and knowledge to continue into this level of training. This Program is designed to train divers to conduct dives to depths between 30 m and 54 m using custom blend breathing gas mixtures; and to provide greater understanding of custom blend breathing gas mixtures, a complete knowledge of the limits of any EANx mixture, and the use of EANx and oxygen for decompression. Must provide proof of a minimum of 100 logged dives, of which at least 30 were deeper than 27 m or sufficient experience doing technical dives to satisfy the instructor that the student has the ability and knowledge to continue into this level of training. This Program is designed to train those who wish to dive to depths between 39 m and 60 m, but who do not wish to breathe air below 39 m. Trimix affords a means of reducing narcosis on dives to such depths. The knowledge and skills taught in this program are more than adequate to qualify divers to perform Trimix Dives outside of training up to 60 m.
Diving with trimix, many cannisters, complex decompression. This course can be combined with another courses. This Program is designed for those individuals already involved in deep diving activities, but is not intended to be used as an enticement to divers who are content to remain in Sport or EANx diving limits. Trimix affords a safer means for deep-water exploration for divers who dive deep or perform with a clear head at depth. The IANTD Trimix Diver Program requires the diver to be self-sufficient/reliant. The knowledge and skills taught in this program are more than adequate to qualify divers to perform Trimix Dives outside of training up to 100 m.
Must be qualified IANTD Technical Diver, Technical Cave Diver, Technical Wreck Diver, Normoxic Trimix Diver or equivalent. Must provide proof of a minimum of 200 logged dives, of which at least 25 were to depths between 39 m and 60 m or sufficient experience doing technical dives to satisfy the instructor that the student has the ability and knowledge to continue into this level of training.